Quaint log home situated on over 5 beautiful acres with terrific views overlooking Saddle Mountain, Sleeping Giant and Trout Creek. 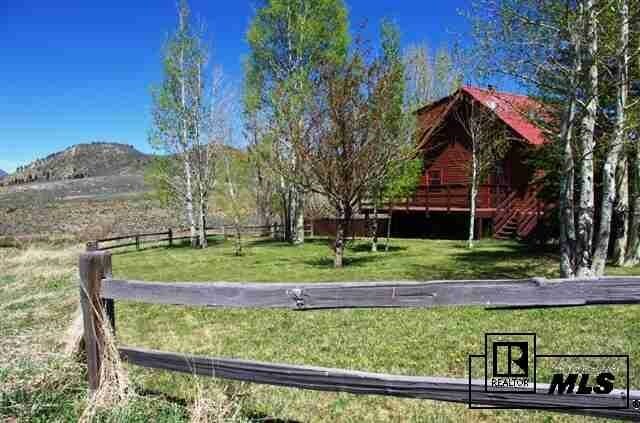 Located in Saddle Mountain Ranchettes, you can experience the peacefulness of country living while only a quick 15 minutes from Steamboat Springs. The charming home features 2 bedrooms, 2 baths, hardwood floors, vaulted ceilings, a huge wrap around deck and fenced yard. Other amenities include a huge 4 car garage/shop, a greenhouse, garden beds, mature trees, vintage tractor, plus additional storage sheds. Bring your toys and animals and enjoy this country retreat!